Tight security was in place as the nation celebrated its birthday with Independence Day's traditional menu of observances: picnics, parades, fireworks, oohs and aahs, and salutes to American men and women serving in Iraq and Afghanistan. In Washington, D.C., Park Police and 20 other law enforcement agencies kept a wary eye on the celebration, in the wake of the car bombs found last week in London and the attack Saturday on the airport in Glasgow, Scotland.. The National Mall area was flooded with officers and high-tech security devices, and police helicopters were on hand to monitor the crowds from above. As with past July 4 festivities since the Sept. 11 terrorist attacks, the mall was fenced off and visitors were required to pass through security checkpoints - eliminate potentially dangerous bottlenecks. 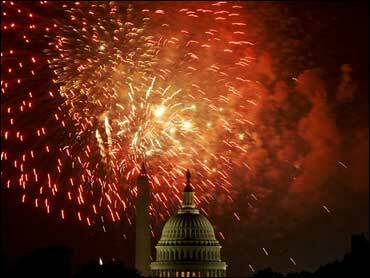 Independence Day festivities in Washington included a parade on Constitution Avenue, a concert by the National Symphony Orchestra on the West Lawn of the Capitol and a fireworks show. With a record number of holiday travelers out and about, security everywhere is extra tight. For those traveling by air, that's going to mean allowing a little extra time, reports CBS News correspondent Nancy Cordes, both to deal with the extra crowds and to deal with the very visible extra security. In New York City – site of the nation's largest fireworks display – it was a soggy but enthusiastic celebration, as an estimated three million people stood in heavy rain, admiring a show with 40,000 fireworks – about 1,300 shells per minute, shot from eight barges on waterways surrounding the city. Crowds sporting umbrellas and ponchos stood along the river to see fireworks including the Jellyfish, which resembles the underwater creature, and the Electric Rice Krispies, crackling metallic shells. They cheered, applauded and laughed as the fireworks went off overhead. "Awesome!" exclaimed Ben Fedak, a Queens musician taking in the show with his brother, before dazzling green shells exploded above him. "This is the best fireworks show that I've ever seen." For the first time the annual Macy's show featured exploding shells aimed down, not up. The so-called Nautical Strobes and Mines exploded on the surface of the East River, remaining illuminated for a few seconds before fading out. Grown men gasped at the fireworks that looked like hearts and smiley faces and flinched at the loud booms, which echoed off buildings. One 7-year-old boy had to reassure his dad: "They're not scary at all," second-grader Daniel Hernandez said. The program's music included an original piece by award-winning composer Stephen Flaherty, patriotic songs and the themes of the movies "Superman" and "Pirates of the Caribbean: Dead Man's Chest." Other musical performers appeared around the city as part of the nationally televised broadcast. They included Martina McBride, Joss Stone and "American Idol" winner Jordin Sparks and contestants Blake Lewis and Melinda Doolittle. In a less elegant but equally traditional Fourth of July event, in Coney Island, N.Y., Joey Chestnut won the annual hot dog eating contest, broke his own world record by inhaling 66 hot dogs in 12 minutes — one every 10.9 seconds. The gut-wrenching achievement dethroned the six-time champ, Takeru Kobayashi, in the process. Kobayashi could only manage to down 63 hot dogs and buns. Hours before the pyrotechnics began, New York City Mayor Michael Bloomberg marched in an Independence Day parade on Staten Island and told reporters that many security efforts to protect the city during the fireworks show would not be readily apparent. "We have lots of police where you can see them, and we have lots of police where you can't see them," he said. With security officials still wary following failed terror attacks on Glasgow and London last week, additional uniformed police officers and heavy-weapons teams were out patrolling and setting up checkpoints to examine people's backpacks. No arrests were immediately reported at the festivities. Security was also very heavy in Boston, where troops in uniform waved flags and danced at a free concert Wednesday evening as tens of thousands of people gathered on the banks of Boston's Charles River for a a spectacular fireworks display celebrating America's independence day. "I thought they were going to do a cavity search for awhile," Armand Devoe of Beverly, Mass., told the Boston Globe. Devoe, who has been coming to the 4th of July festivities for about 20 years, says officers thoroughly searched his backpack and made him empty his pockets. Rocker John Mellencamp played two of his most patriotic songs: "R-O-C-K in the USA" and "Our Country." It was a day to honor military service. The Army honored its one-millionth veteran at an American Legion post in Philadelphia. The recognition went to Bronze Star recipient Bill Beck of Steelton, Pa.
"I'd rather be honored with this than win a million dollars in a lottery, because my wife would spend a million in a couple of weeks and I'll have this for the rest of my lifetime," Beck said in a phone interview. Americans on duty in Iraq and Afghanistan marked the day in their own way, as did their families, thousands of miles away. Brigadier General Kevin Bergner, the chief U.S. military spokesman in Iraq, says it's tough being away from family, but he says when you're serving with a group of soldiers, sailors, airmen and Marines, they become "another family." And he says it's an honor to be celebrating with them. As he has done the past three years, President Bush spent Independence Day in Martinsburg, West Virginia, visiting the National Guard's 167th Airlift Wing. In his Independence Day proclamation, Mr. Bush said the nation is always blessed by those willing to defend it in its hour of need. Speaking to the men and women of the 167th – who have spent time in both Iraq and Afghanistan – the president said he honors the sacrifices of U.S. troops, but now is not the time to bring them home. In some cities – especially a string of places in Pennsylvania, including Philadelphia – stormy weather forced the postponement of the fireworks for later in the week. The celebration in Philadelphia included a reading of the Declaration of Independence at Independence Hall, and descendants of signers of the original declaration were on hand for a symbolic ringing of the Liberty Bell. In other areas, the holiday problem was too little rain. Dry weather conditions are another cause for concern and have curtailed the use of fireworks in several areas around the country. Breckenridge, Colo., had to cancel its fireworks show because of the high-fire danger posed by dry conditions and stands of dead trees. In Washington state, private fireworks are banned in Seattle, Tacoma and parts of Spokane. About 1,000 people from around the globe became U.S. citizens at Walt Disney World, raising their right hands in front of Cinderella's castle at the Magic Kingdom as the oath was read by Emilio Gonzalez, head of U.S. Citizenship and Immigration Services. "I dreamed for this moment for 13 years, and finally this is my last dream that I have," said Marta Hima, who came from Colombia and now lives in Davenport, Fla.
More than 350 new citizens were sworn in at Phoenix. "Now I feel like I can be part of this community," said Alicia Gray of Gilbert, Ariz., who came to the United States from Mexico in 1996 and brought her American husband, her children and in-laws. "I'm more a part of this country now."